Ideally, the central lower back region should have an esthetic appearance of a gentle concavity (caved in area) – sometimes referred to as the “small of your back”. In females, this “caved in” region should then gently flow into the normal convex (rounded outward) shape of a buttock. This relationship contributes to the normal attractive appearance of the feminine lower back. Although generally rare, some patients develop a localized accumulation of fatty tissue in the central lower back region. This disrupts the normal attractive feminine curves of this zone. Together with the bulge of the love handle area, lower back fat can also produce the dreaded “muffin top” look of fatty tissue flowing over the back and sides of your pants. This region tends to be particularly stubborn and resistant to both diet and exercise. Men can also develop a bulge of fatty tissue that protrudes over the edge of their pants in the central lower back region. HOW DO I KNOW IF I AM A GOOD CANDIDATE FOR LOWER BACK LIPO? Put on a pair of your favorite jeans and look closely at the middle of your lower back – the part that is just above your belt line. If you notice a bulge of fatty tissue protruding in this region, then you may be a candidate for liposculpture of the lower back. In females, the central lower back should look somewhat “caved in” as compared to the convex (rounded outward) appearance of the buttock. If this type of relationship does not really exist, then you may be a good candidate for lower back liposculpture. Dr. Hayduke prefers to perform lower back liposculpture in the office under local anesthesia. 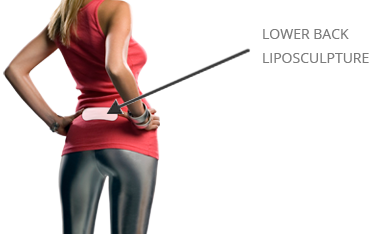 Since this area is generally small, lower back lipo is often combined with liposculpture of the love handles or thighs (or any other area of concern). Patients change absorbent pads that are placed over the area twice per day for the first two days after the procedure. An elastic compressive binder is worn for one week. Patients can be back at their desk jobs in about 48 hours.